The department of Computer Engineering was established in the year of 2010. 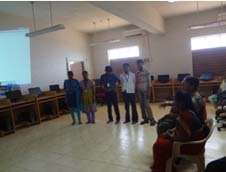 The department of Computer Engineering is committed to provide value-based education for students and to develop the knowledge, overall personality of the students to enhance their creativity, self-confidence, assertiveness, communication and leadership skills. Analyzing and solving computer-oriented problems. Understand both the hardware and the software of computers. This enables them to choose the solution that is best, not just the one they know. The department has a devoted team of faculty members who are well qualified and experienced in the areas of Software and hardware field. Programmes are planned with the specific objective in imparting technical knowledge, improving the skills and developing a better and positive attitude in students. This lab provides an introduction and in-depth exposure to programming knowledge for the students. In this they are doing lab programs using arrays, structures, union, control statements, string, file and pointers. Students are exposed to do the programs such as Factorial, palindrome, sorting, string operations, and file manipulations using C and C++ Language. 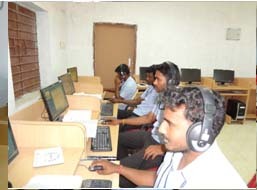 The Communication lab helps the students to understand the different methods of communication. These strategies will provide a great benefit for any organization and its employees. Through this lab, students are learning how to face the interview, how to communicate effectively with others. This practical covers the Basic Linux commands and Shell Scripting. Students learn about the syntax of each and every Linux Commands and writing of the shell program, so student’s efficiency of using Linux operating system will be improved. This practical covers the SQL(Structured Query Language) commands and PL/SQL Scripting. Students learn about the syntax of each and every SQL Commands and writing of the shell program, so student’s efficiency of using data base system will be improved. This lab focuses on the creative and technical aspects of the graphic designing, Animations and Simple Multimedia Application creation. Troubleshooting of different devices in the computer. In Project work and Entrepreneurship, Students are exposed to develop a project in different platform areas such as .NET, Hardware oriented, embedded systems and networking.